Tenth-grader Yugi always had his head in some game—until he solved the Millennium Puzzle, an Egyptian artifact containing the spirit of a master gambler from the age of the pharaohs! Possessed by the puzzle, Yugi becomes Yu-Gi-Oh, the King of Games, and challenges evildoers to the Shadow Games...weird games with high stakes and high risks! In a life-or-death match of Duel Monsters, Yugi fights for the most powerful magic of all—his forgotten Egyptian name! And in the 3,000-year-old Millennium World, forces of good and evil clash in a final battle. What will Yu-Gi-Oh face at his final destination in present-day Egypt? Will the bonds that hold the pharaoh’s soul be broken at last? Find out in this final volume! Original Yu-Gi-Oh! 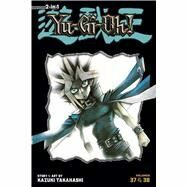 creator Kazuki Takahashi first tried to break manga business in 1982, but success eluded him until Yu-Gi-Oh! debuted in the Japanese Weekly Shonen Jump magazine in 1996. Yu-Gi-Oh! 's themes of friendship and competition, together with Takahashi's weird and wonderful art, soon became enormously successful, spawning a real-world card game, video games, and six anime series (two Japanese Yu-Gi-Oh! series, Yu-Gi-Oh! GX, Yu-Gi-Oh! 5D's, Yu-Gi-Oh! Zexal, and Yu-Gi-Oh ARC-V).